Oct 13: The recent Chilean wine tasting organised by ProChile and the Embassy of Chile was covered widely by the media but the language used by some of the reports might have been original to the writers but left a bitter and unpleasant though amusing after-taste. While it is early days yet but the writers and readers in India need to educate themselves on the basic wine vocabulary, writes Subhash Arora. It is not my intent to go into the content of the article but I will stick to some of the vocabulary used, only to help our Indian readers appreciate the importance of using correct wine language. ‘Swig of spicy red Chile in Indian Wine Glass’ said the heading of the article in a prominent daily. Swig or Sip: One does not like to use the word Swig for wine which one ought to sip. The dictionary defines Swig as ‘engaging in drinking liquid in great gulps’. You may have a swig of coke, water, lassi, beer or maybe even whisky but not wine. You sip wine, enjoying the flavours by letting it caess all parts of the palate and then slowly letting it go down. Would you take a sip of tea or a swig?! The Latin American nation of Chile is keen to introduce its national brew, a spicy red wine, in the Indian market. Brew: ‘Brew’ is never used for wine. Widely used for beer, it is sometimes used for tea and coffee. But have you heard of whisky being a brew? Dictionary clearly defines brewing ‘to make (ale or beer) from malt and hops by infusion, boiling, and fermentation and to make a beverage by boiling, steeping, or mixing various ingredients like brewing tea or coffee. You are really brewing trouble by using the term for wine. It should always be avoided at all costs. I failed to understand what was ‘national’ about the spicy red wine. Chile makes all sorts of wine-red, white, rose and sparkling in various styles, spicy red is one of them. Carmenere, a vintage French wine, was 'rescued' by Chile 150 years after it disappeared from vineyards across Europe. Carmenere: Carmenere is the name of the grape-usually termed as varietal for wine grapes. It used to be grown in Bordeaux as one of the six grape varieties before it was hit by Phylloxera in the 1860s. Many winemakers dashed off to Chile looking for jobs and took with them cuttings that included Carmenere. Over the period, it merged with the similar looking Merlot and the Chileans thought it was a clone of merlot. Even expert eyes cannot generally tell the difference. The grape varietal survived well in Chile as the louse disease was blocked away presumably by the high Andes Mountains. Chileans were merrily using the grape that produces wine which is slightly spicy and earlier ripening than Merlot. It is difficult to ripen adequately, so France abandoned it when it re-stated growing grapes by using American root stocks and grafting techniques. 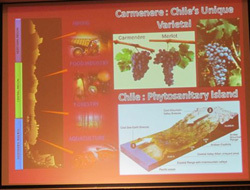 Carmenere continued to be used as Merlot in Chile till a French viticulturist Professor discovered in 1994 that a lot of Merlot vines were actually Carmenere. Since Chile is about the only country using it as a Merlot ‘varietal’, it was recognized as a separate grape varietal in 1998 and came to be known as the signature grape of Chile, that is to say Chile came to be identified with this grape. Vintage French Wine: Obviously Carmenere has nothing to do with a Vintage French wine, a term that has its own complex character. Vintage normally refers to the year of harvest ONLY. In countries like France it has a great significance as the climate changes from year to year affects the quality of each vintage. Grapes from certain years make very good wines that can age well and these are referred commonly as vintage wines- they could be French, Italian or even Californians. Therefore it would be absurd to call Carmenere-or any other French grape a Vintage French Wine. We export different varieties of wine to India, but we are eager to introduce our national wine, Carmenere, to this country where people are beginning to enjoy wine," Christian Barros, the ambassador of Chile to India, said at a Chilean wine tasting show in the capital. National wine, Carmenere: Fortunately, the ambassador did not quite say it in those words. The objective of focusing on the signature grape varietal of Chile seems to have been unfortunately lost in the misinterpretation. Incidentally, Carmenere has been present in India for over a decade (it was served at the Chilean National Day celebrated at Olive Qutab about 5-6 years ago. The Chileans want to identify more with the grape as a signature grape of the country now. The display of Chilean wine at the Hotel Lalit on Tuesday evening featured 10 brands, including the traditional Carmenere and Malbec red wines, typical of the Latin American region. Brands: There were over 70 brands-but only 10 producers. Each producer has several brands also known as labels or even simply as wine. For instance, someone making 14 labels may say he produces 14 wines. Malbec is a traditional grape of the neighbouring Argentina though used to a small extent in Chile. There were about 15 wines with the varietal Carmenere and slightly lesser number used as a blend. In contrast, there were only 2 Malbec varietals. Other red wine genres like Cabernet Sauvignon, Shiraz, Merlot and the blends (mix of several red wines) also vied for attention with the white varieties of Sauvignon Blanc, Late Harvest, Chardonnay and Pinot Noir. Genre: Defined as a category of artistic composition, as in music or literature, marked by a distinctive style, form, or content. Cabernet Sauvignon, Shiraz, Merlot should hardly be seen as a Genre. There is nothing wrong with simply sticking to grapes or grape varietals when describing these wines. Late harvest: This is a state of maturity of the grape on the vine and has nothing to do with the colour of the grape, though usually one sees more of whites being Late Harvest which makes the grapes reach much higher sugar content thus making a sweet wine- Sula and Big Banyan make excellent Late Harvest wines, for instance. Pinot Noir: Lest someone got confused reading the article, Pinot Noir is a red grape (Noir!!) and not white. Belonging to the same family though, the white grapes are Pinot Blanc (Pinot Bianco in Italy or Weissburgunder/ Weisserburgunder in Germany, Austria o Switzerland) and Pinot Gris (Pinot Grigio in Italy). Blends (mix of several red wines): Although blend is usually a mix of red wines, there are also several blends of white wines- Semillon Sauvignon, Chenin Chardonnay being the most common blends. Apno Grover Vineyards makes a Viognier- Clairette white blend. Sometimes there are whites blended with reds in a small proportion- Shiraz Viognier is a classic example. Chateau-Neuf du Pape in South France uses up to 13 grapes that also include white grapes. Blends may not necessarily be of wines. Sometimes the grapes are mixed before fermentation, still making a blended wine. Going a step further, there are field blends too. Different grapes have been planted within the same area in the vineyard-sometimes the producer may not even know the varietals or the number. But these are blends too. "We are looking for Indian importers for our national wine, Carmenere. Right now, varieties of Merlot, Cabernet and Sauvignon Blanc make up 80 percent of our sale in India," Christian Sotomayor, a spokesperson for Valdivieso, winery which makes fresh wines, said. Fresh: I wonder if Sotomayor who is a leading and well respected producer in Chile would make a statement like that. Not getting into the national wine, Carmenere clarification suffice it to say that freshness is a positive characteristic of any wine-particularly white wine and it symbolizes the positive perception of acidity on the palate. One likes to drink more of the wine if it is fresh. If you make wine that is not fresh, you will be soon out of business. While the definition of ‘fresh’ may not be applicable to a journalist, especially a fresh wine journalist, it may not be out of place to exhort one to try to use the basic language correctly. ‘Mind it’ as the superstar Rajnikant would say or think of the good ol’ BBC serial ‘Mind Your Language,’ when trying to innovate while writing about wines.